Register today for the May 23rd H.Y.P.E. 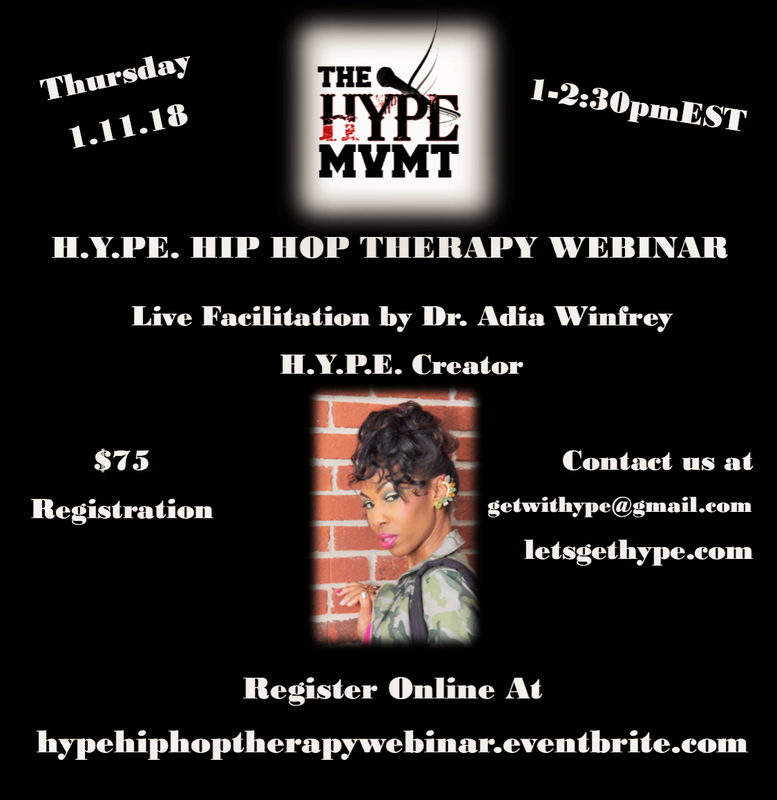 Hip Hop Therapy Webinar! 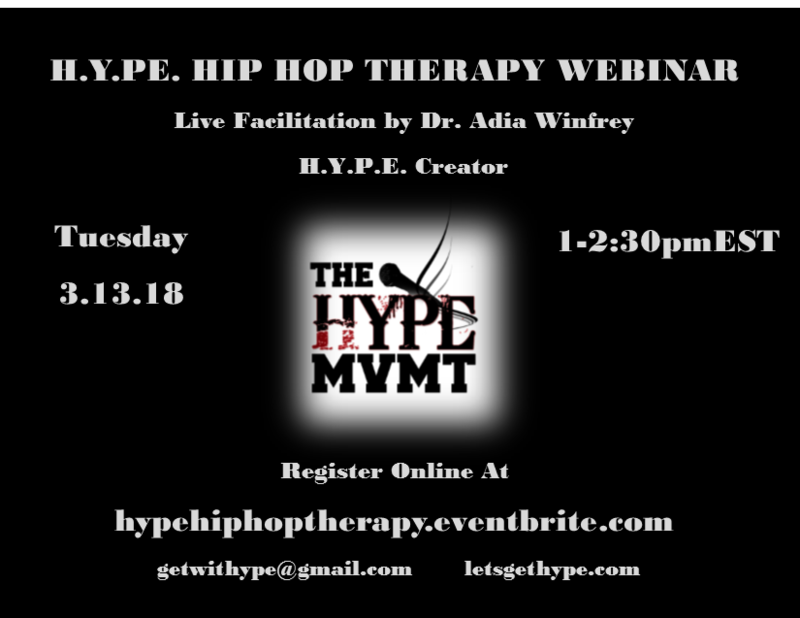 Nationally-recognized founder of H.Y.P.E., Dr. Adia Winfrey, will be in Louisville to share her experiences on how hip hop music empowers young people and discuss her bold, new approach to reaching young people. H.Y.P.E. -- Healing Young People thru Empowerment -- integrates Hip Hop culture into a program designed to educate and inspire youth. 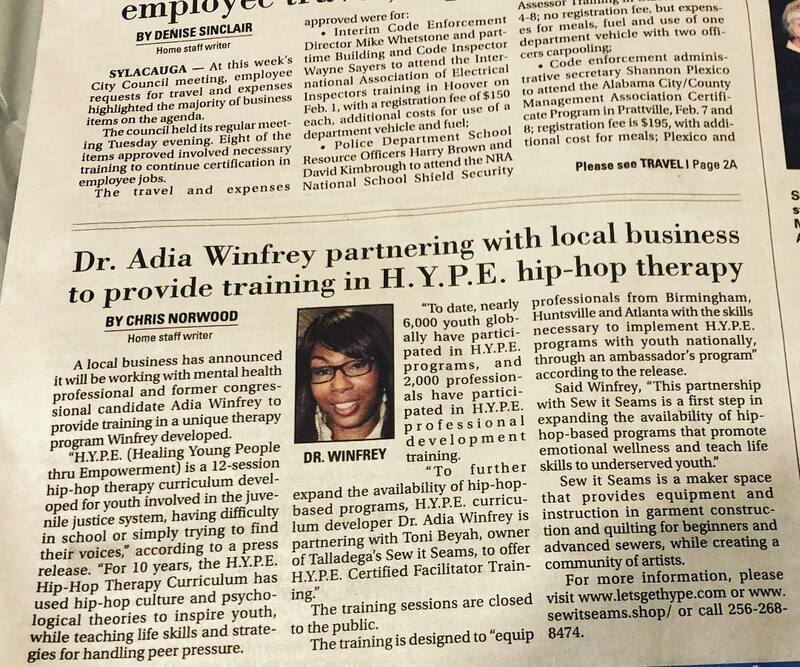 Dr. Adia Winfrey, also known as Dr. Dia, is a published author and mentor to youth who developed the H.Y.P.E. curriculum while completing her Doctorate of Clinical Psychology degree at Wright State University School of Professional Psychology. H.Y.P.E. uses familiar Hip Hop music, themes and values to help young people at-risk discuss and address challenges they face at home, in school and in their communities. H.Y.P.E. was introduced in Louisville in 2011 by Louisville Metro Department of Community Services as part of the agency’s mission to strengthen low and moderate income youth and families. Outreach staff member and certified H.Y.P.E. facilitator, Ciceley Bishop, has trained nearly 50 youth at agencies including the Baxter Community Center, Maryhurst, Jefferson County Youth Center and the PAL Coalition, (Parkhill, Algonquin and Old Louisville neighborhoods). The Atlanta Voice featured Dr. Dia's commentary on the importance of early emotional wellness interventions with Black youth. Dr. Dia and Grammy Award winning artist/producer David Banner co-authored "What's Killing Our Culture? III: Ignoring the Illness." The unlikely pair challenged readers around the country, while offering hope for the future, by exploring the lyrics of David Banner's song "Swag." Check out this groundbreaking op-ed that forevever changed Hip Hop Culture. Dr. Dia is calling all members of Hip Hop Culture to task with The Hip Hop Manifesto. Check out the article that's encouraging members of Hip Hop Culture to go harder around the globe! It's time to re-claim our spaces and voices! On January 25th, Dr. Dia got HYPE with 11th grade students in Mr. Amil Cook's (@amilcook) Career Readiness classes at City Charter High School. During her interactive presentation, Dr. Dia challenged the students to transform their weaknesses into strengths, and dream bigger than they ever believed they could. Stay tuned for a follow-up blog post exploring the importance of this experience. The Chicago Music Summit is a new conference presented by the Department of Cultural Affairs and Special Events being September 20th. The Chicago Music Summit provided free professional development and exposure to support Chicago’s music industry. During the Chicago Music Summit, Dr. Dia was a Hip Hop Peace Summit panelist. The Hip Hop Peace Summit Panel, co-moderated by WGCI’s Leon Rogers and JET Magazine’s Kyra Kyles, explored ways Hip Hop culture can foster peace throughout the city of Chicago. 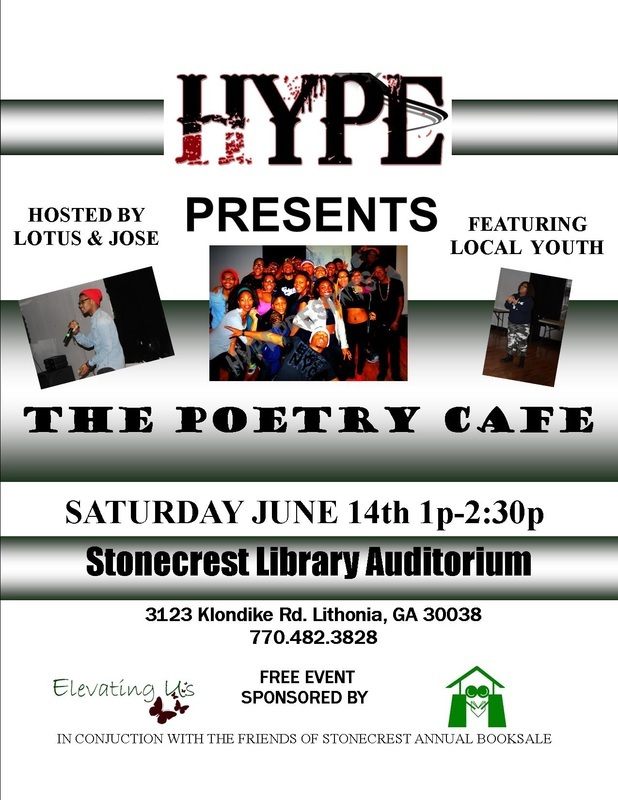 HYPE Presents The Power of Music and Poetry, was a free event held at the Stonecrest Library for individuals over 12 years old. Attended by over 100 youth and adults, The Power of Music and Poetry included a panel discussion, rap ciphers, spoken word, and vocal performances. Attendees left this event having felt the power of music and poetry, empowered to find their voice. Special thanks go to the Friends of Stonecrest Library, All About Books, and Images by Pierre. On January 8th Dr. Dia was the featured speaker for the Miles College Freshman Orientation Week. She encouraged the incoming freshman to embrace their gifts and use their passion to shape their college experience future careers. On December 17th, the “Brainiac Project”launched a Kickstarter campaign that will continue until February 15, 2013. Learn more and back this inspiring project, at Kickstarter.com. September 26th-30th Dr. Dia presented H.Y.P.E. to audiences throughout the UK, from Oxford to Brixton! Lifetime honors extraordinary women who inspire others to make a difference in the world. NYU's Steinhardt School of Culture, Education, and Human Development in June 2010, in collaboration with the Metropolitan Center for Urban Education. 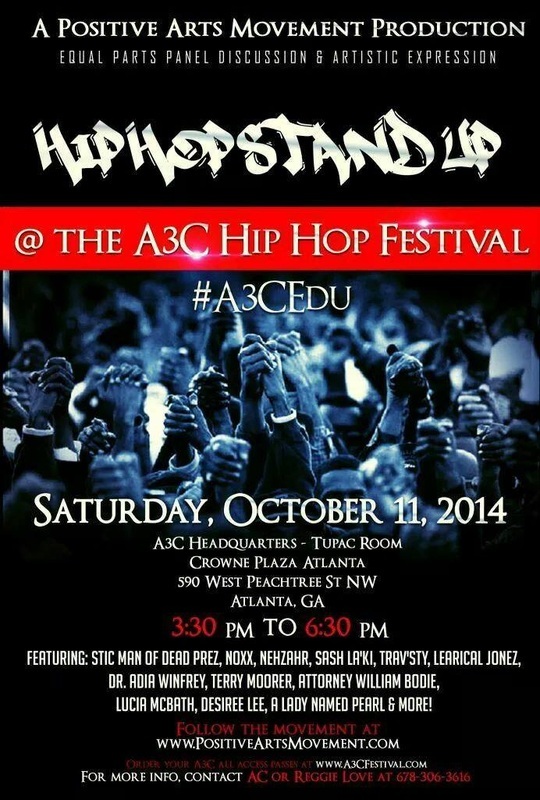 H2ED Center was formed to explore the potential of Hip-Hop pedagogy and the culture’s role in various fields. The Center is also providing effective assistance to schools and underserved communities to increase student and community engagement, academic achievement, and social equity. For ten years, Martha Diaz served as president and executive director of the award winning Hip Hop Association prior to this partnership. A trailblazer in the area of Hip Hop education, she launched H2ONewsreel, the first Hip-Hop media distribution label dedicated to the education field, and co-created the Hip-Hop Education Guidebook, Vol. I with Dr. Marcella Runell Hall. Dr. Dia was one of 11 Wright State University Alumni to receive the 2012 Outstanding Alumni Award. During the 12th annual College Outstanding Alumni Awards Luncheon, each college recognized former students who've gone on to make exceptional contributions to their professionals fields, while giving back to their communities. Wright State University School of Professional Psychology selected Dr. Dia (Class of 2008) for this honor based on her work with youth, and trailblazing contributions forever solidifying the relationship between Hip Hop culture and the field of Psychology. Genesis Be is educating youth through Hip Hop, while simultaneously changing the entertainment industry with Strive Till I Rise. Strive Till I Rise is a movement educating youth about voting practices, HIV/AIDS prevention, the college process, and community activism through workshops, college tours, online media, mixtapes, and block parties. A 2011 graduate of New York University’s Clive Davis Department of Recorded Music, Genesis Be has returned to the Gulf Coast and is using the Strive message to challenge youth and adults throughout the region. Most recently, Strive Till I Rise wrapped a five presentation series for the Boys & Girls Club. The movement is also organizing an original music project, in collaboration with children nationally, that will explore HIV/AIDS, teen pregnancy, and drug use. View more Strive Till I Rise videos and news at strivetillirise.com and on the Strive Till I Rise YouTube Channel. Tax deductible contributions can be made to this groundbreaking organization here. Individuals from around the country representing various professions came to Atlanta, GA for Let's Get H.Y.P.E. Hip Hop Empowerment Training and were forever changed! Trained H.Y.P.E. facilitators will now be starting new groups throughout Ohio, Alabama, Tennessee, Florida, Puerto Rico, and Georgia. Special thanks go to Elevating Us, LLC, TOADD.org, and the Holiday Inn Atlanta Capitol Conference Center. View pictures from this momentous event on the 2011 Let's Get H.Y.P.E. Training page. I'm BOOKed Atlanta is a community initiative that promotes literacy among elementary, middle, and high school students in Atlanta's Pittsburg Community. Students participating in the I'm BOOKed 30-Day Challenge were given the opportunity to meet the featured authors, and upon completing the challenge, awarded cash and prizes. The I'm BOOKed Atlanta 30-Day Challenge concluded with an Award Ceremony on November 19th. Dr. Dia, Hip Hop artist Queen Nef, and H.Y.P.E. Mentees Bakari Benton and Damone Williams created an I'm BOOKed theme song which was performed during this event. The next cycle of I'm BOOKed Atlanta will begin February 2012. View pictures and video of Dr. Dia and H.Y.P.E. Mentees during the Week 2 Reading Circle October 22nd to the right. Check out the I'm BOOKed Award Ceremony performance below. On November 18th, Dr. Dia spoke to over 70 students at Stone Mountain Elementary School’s Annual Career Day in Stone Mountain, GA. During this event, she encouraged Kindergarten through fourth grade students to embrace their talents and interests. During Dr. Dia’s presentation, students shared their hobbies and career aspirations. Several youth and teachers invited her to speak to their classes at other times during the school year. About 20 other professionals participated in Stone Mountain's Career Day activities. The H.Y.P.E. Movement Joins the Occupiers! 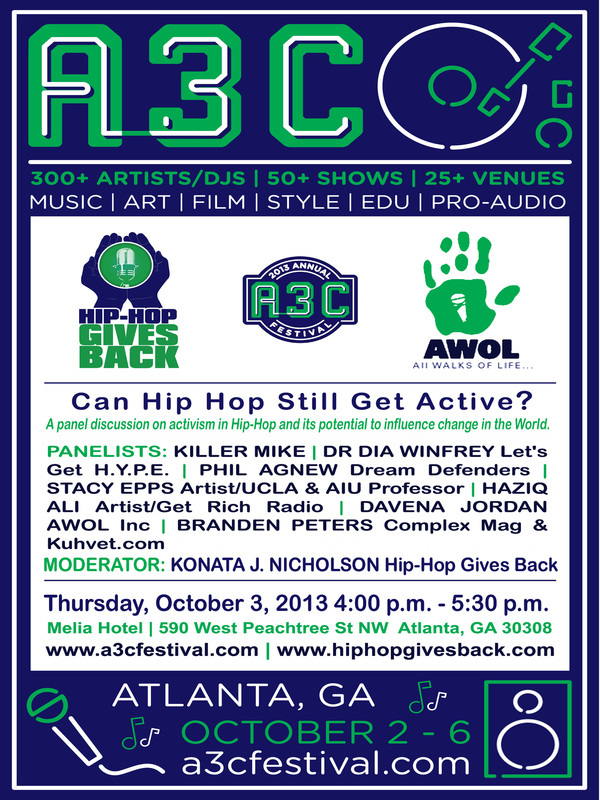 On October 22nd, Atlanta's Hip Hop Community joined forces with Occupy Atlanta and Occupy the Hood Atlanta in Troy Davis Park (Woodruff Park). H.Y.P.E. 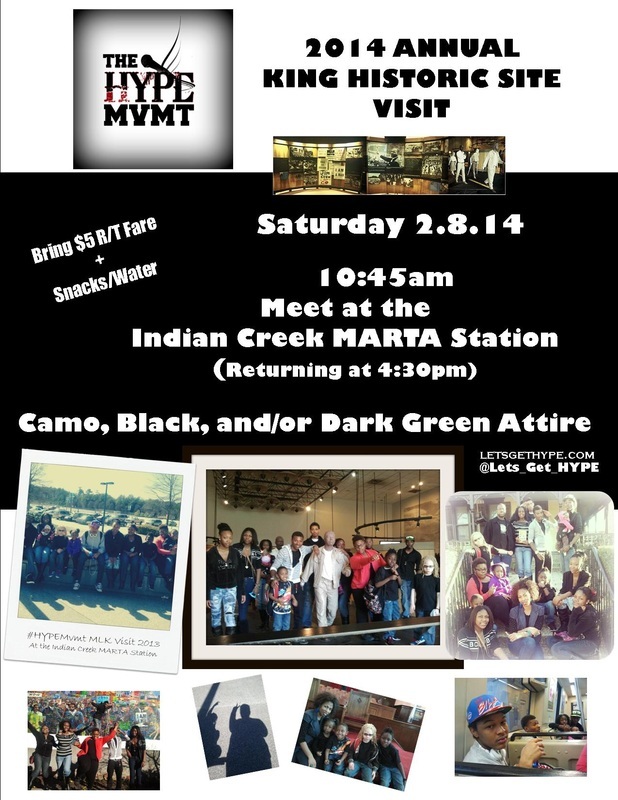 Movement mentees took this historic opportunity to build with people from many walks of life. They also did several impromptu acapella and accoustic performances around the park. October 22nd also marked the National Day of Observance to Stop Police Brutality. H.Y.P.E. Movement mentees met the family of many police brutality victims, and began challenging themselves to create plans of action. Check out some of the pictures from this momentous day! Dr. Dia and mentee Damone, returned to Troy Davis Park on October 24th for a joint press conference and march. 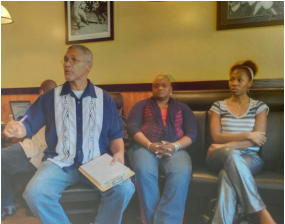 Dr. Dia was a featured panelist during the September TalkBLACK Atlanta discussion on the Prison Industrial Complex. She discussed the importance of education and connecting with young people in our communities. TalkBLACK Atlanta was featured in the April 2011 issue of Black Enterprise Magazine. Read the article in its entirety here. September 22 & 23 Dr. Dia will be a featured presenter at the Understanding Cultural Competence Conference, being held at the Lake Terrace Convention Center in Hattiesburg, MS. The aim of this conference is designed to meet the needs of child-serving agencies and families in hopes to educate on how to successfully embed cultural competence into policies, procedures, and practices in every level of service delivery. Learn more about this groundbreaking conference by clicking the picture to the left. Throughout the months of June and July, Dr. Dia and The HYPE Movement were featured guests on the Live Internet TV Show Starving The System. On each episode, Dr. Dia discussed the necessity of empowering our youth, and the effectiveness of the H.Y.P.E. Curriculum. Let's Get H.Y.P.E. Hip Hop Empowerment Training was also discussed, and those who've worked with Dr. Dia had an opportunity to call into the show. Check out the July 28th episode of Starving The System, which featured HYPE Movement Mentees Brandi, Bakari, and Damone, by clicking the picture to the left. Starving The System, the Live Internet TV show airs Thursdays at 7pm on starvingthesystem.com. Women from around Atlanta will be recognized during the Kim McNair Productions First Ladies' Charity Brunch with the First Lady of the Year Award. The First Lady of the Year Award recognizes outstanding women throughout Metro Atlanta, and Dr. Dia was selected based on her work with our youth through H.Y.P.E. View pictures from the event on sheenmagazine.com. On June 4, 2011, the Butler Street YMCA Multicultural Achievers Program held their annual Achievers Luncheon, which recognizes Achievers graduating from high school. In addition, Multicultural Achievers staff and participants recognize individuals from the Atlanta area making a difference in the community with the Adult Achievers Award. This year, Dr. Dia was one of the five individuals selected! Mr. Al Duncan (pictured with Dr. Dia), a world-renowned youth motivational speaker, gave the keynote address. Learn more about the Butler Street YMCA and the Multicultural Achievers Program on their website. A multimedia research project currently being incubated at the Hip-Hop Education Center at NYU's Metro Center, Fresh, Bold, & So Def: Women In Hip-Hop Changing The Game was created to empower and cultivate women in Hip-Hop through an educational and entrepreneurial social enterprise solution’s model. The objective is to promote positive images and motivational stories of powerful women in diverse roles and leadership positions within Hip-Hop culture through an educational resource book. Fresh, Bold, & So Def: Women In Hip-Hop Changing The Game can be used in classrooms, libraries, museums, community centers, forums, employment centers, and correctional facilities. Check out Dr. Dia's feature in Fresh, Bold, & So Def Women here. To pre-order your copy email quasar729@gmail.com. On May 5th Dr. Dia, spoke to over 50 parents representing a number of Atlanta Public Schools about strategies for countering bullying. By the end of her presentations, the audience was on their feet, and developing strategies for forming small parenting groups in their neighborhoods. Hip Hop Education Week kicked off April 4th with a proclamation from the Newark City Council and Mayor Cory Booker. Hip Hop Education events took place daily until April 11th, with The Diverse Methods in Learning Conference convening April 8th and 9th. This event was a collaboration between the Temple of Hip Hop, H2Ed, and Essex County College. Dr. Dia was selected to join a panel discussion on Friday April 8th titled, "What are the benefits of a Hip Hop Curriculum and Course of Study?" by a peer review council. She presented H.Y.P.E. and the Hip Hop Empowerment Model to educators, Hip Hop legends, youth advocates, and a variety of other professionals from around the country. Dr. Dia was a Special presenter at the 2011 Ohio Rehablitation Counseling Association (ORCA) Spring Conference. The conference was held at Deer Creek Resort and Conference Center April 14th-15th near Columbus, Ohio. Over 50 individuals representing different facets of rehabilitation counseling from around the state of Ohio were present. Dr. Dia's presentation was well received, and she's been invited back to future counseling trainings and conferences. ORCA is the state chapter of the Naional Rehabilitation Counseling Association. 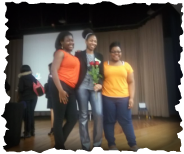 On March 31st, Dr. Dia was an invited guest as students at Redan High School celebrated Women's History Month. Dr. Dia talked to an audience of over 30 male and female students about the importance of dreaming big and overcoming fear. She encouraged the students to embrace those qualities that make them unique and act on ideas now, as opposed to waiting for adulthood. Special thanks goes to Communities in Schools Atlanta. Contact Talia Moore at talia_moore2907@yahoo.comto bring the “Hidden Secrets” panel and documentary to your town. On February 22, 2011, WABE, the National Public Radio (NPR) affiliate in Atlanta, featured a story highlighting the work Dr. Dia is doing with young people using the H.Y.P.E. curriculum. In this personal and thought provoking piece, National award winning journalist Chandra R. Thomas explores the program in detail, and interviews Dr. Dia and youth participating in a H.Y.P.E. group in Georgia. Listen to the entire NPR feature here. On February 21st and February 22nd, The Juvenile Justice Information Exchange (JJIE.org) featured stories about H.Y.P.E. written by journalist Chandra R. Thomas. In addition, through a partnership between National Public Radio's Atlanta affiliate WABE and JJIE.org, a video was developed, featuring the NPR story, which originally aired February 22nd. JJIE.org provides information focused on juvenile justice issues and highlights strengths and weaknesses in the Georgia Department of Juvenile Justice. The Juvenile Justice Information Exchange is supported by The Center for Sustainable Journalism at Kennesaw State University. 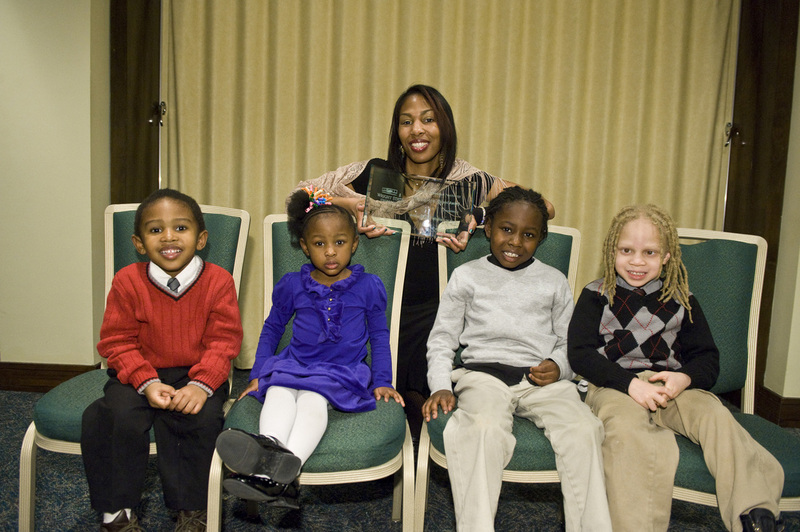 On February 23, 2011, Dr. Dia was featured in the Covenant Youth Empowerment (CYE) online newsletter. CYE is an Atlanta-area agency providing mental health care to children and families. With a focus on the strengths of their clients, the relationship between Dr. Dia and CYE has been rewarding for numerous families throughout Atlanta. Check out Dr. Dia's interview here, or select the CYE logo to view their entire site. Keisha Walker is a fourth grade teacher at Wynbrooke Elementary School in Stone Mountain, GA. When she began teaching 10 years ago, maintaining the attention of her students was challenging, so Ms. Walker came up with “innovative ways to make sure they learned using edutainment.” Specifically, she developed a teaching style that intertwines music, technology, Hip Hop culture, and education, and MC Test A Lot was born. Ms. Walker has found many uses for music in her classroom. As a reading/math teacher, she creates songs to aid with the memorization of concepts. Music is also used to promote appropriate classroom etiquette, and reinforce class rules. Ms. Walker even uses music to boost motivation and preparedness for standardized testing. MC Test A Lot has several videos on YouTube and TeacherTube. View one of her most popular videos “CRCT Walk” by clicking the picture to the left. Contact Ms. Walker at walkerkeisha@hotmail.com to learn more about MC Test A Lot, and effective ways to integrate music into the classroom. Dr. Dia spoke to 3rd-6th grade students at C.L. Salter Elemenary School in Talladega, Alabama on February 21, 2011. During the presentation, which included a 45 minute Q and A portion, Dr. Dia encouraged students to own their role in Black History and urged teachers to recognize the insight their students have. A video developed by Dr. Dia that included over 40 images of the Black American experience was presented, and led to a discussion among students about oppression in America. Special thanks go to the principal Ms. Griffin, the Black History Month chairperson Ms. Fuller, and the PTA. On January 27th, Dr. Dia spoke to several classes at Redan High School during a Bullying Awareness Month event. All grade levels were represented at the event, and youth were encouraged to embrace those characteristics that make them unique. Students were engaged throughout, and Redan High School staff were encouraged by their response. Redan High School, located in Stone Mountain, GA, is recognized as a leading Metro Atlanta High School utilizing innovative approaches to educate their students. Special thanks go to Mr. Walter Carmack and the Georgia Community Resource Center. On January 19, 2011, Dr. Dia was interviewed live on the Tom Joyner Morning Show. She talked to Tom Joyner and the Morning Show crew about how she's used Hip Hop to inspire and empower young people. Dr. Dia's commitment to young people and love of Hip Hop was evident, and Tom Joyner talked at length about his excitement when first reading about H.Y.P.E. in JET Magazine (Jan. 10, 2011). Dr. Dia and H.Y.P.E. were also featured in a story on the BlackAmericaWeb.com. Piper Carter, a freelance fashion photographer, graduate of The Fashion Institute of Technology, and past contestant on Tyra Banks’ VH1 show “The Shot,” was shocked into action in the name of Hip Hop. After moving back to her hometown of Detroit from New York City after nearly 15 years, she learned female MCs and DJs were being denied a platform at Open Mic events around the city. Already concerned with the lack of female presence in Hip Hop, Ms. Carter created The Foundation to provide a supportive space for MCs developing their craft. 5e Gallery, a non-profit, visual art, and Hip Hop gallery founded by DJ Sicari, was an ideal space for Piper to hold The Foundation, as well as her weekly Urban Arts Education Workshop. Piper, in an interview with Dr. Dia said, “I realized how far we had come from having a diverse variety of women in Hip Hop, to the female MC being almost obsolete; though women are more present than ever behind the scenes." In the next five years, Piper sees The Foundation at 5e performing at Hip Hop Festivals nationally, as well as hosting a Detroit Women in Hip Hop Festival. She’s also positioning The Foundation to be a force in film and television, stating "I'd love to see The Foundation become a TV competition." But ultimately, Piper would like The Foundation to produce the next generation of female entreprenuers in Hip Hop behind and in front of the scenes. Undoubtedly, through the efforts of women in Hip Hop like Piper Carter and programs like The Foundation, girls and women will once again be reminded their words have power. Join The Foundation at 5e every Tuesday at the 5e Gallery in Detroit’s Historic Corktown District. Contact Piper at piper@pipercarter.com to learn more about The Foundation, and check out some of her photography at pipercarter.com. Rodney Williams & Music Works Program Inc. December 2010 H.Y.P.E. Monthly Spotlight! Music Works Program Inc. is an afterschool program introducing 5th-8th grade students at five Chicago Public Schools to the business side of entertainment, while placing a premium on academic excellence and community service. Established in 2008, Music Works Program Inc. is the brainchild of Mr. Rodney Williams, a youth advocate for over 10 years. Music Works Program Inc. runs throughout the school year and is comprised of four sessions: Business Development & Organization, Recording Techniques, Graphic Designing, and Marketing. Music Works Program Inc. groups meet weekly from 2p-6p. During these meetings, youth complete a variety of activities including creating a business plan, writing song lyrics, completing homework, discussing topics of interest, recording songs produced by college interns, and creating marketing strategies. While youth obtain experience in each of the four areas described above, Mr. Williams indicated many youth gravitate to activities highlighting their natural abilities. Mr. Williams has owned an independent record label, produced music, and rapped since age 15, and recognizes the empowering aspect of Hip Hop. “Music gets them in, and when they come we talk about a variety of topics.” In the next five years, Mr. Williams wants Music Works Program Inc. groups to be run by college students at 20 more schools. 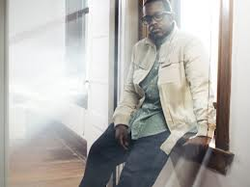 He’s also interested in major recording artists becoming program mentors. Music Works Program Inc. is currently funded through the support of three community organizations and donations generated from music sales. 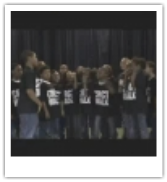 Check out music created by youth involved in Music Works Program Inc. on their website http://musicworksnfp.yolasite.com/music.php. For more information or to get involved with Music Works Program Inc., contact Mr. Rodney Williams at musicworksnfp@gmail.com. November 2010 marked the 1st anniversary of The H.Y.P.E. Communicator, The H.Y.P.E. Movement's monthly e-newsletter. In its first year, The H.Y.P.E. Communicator has been on the cutting edge, as one of the only Hip Hop empowerment publications in circulation. And in addition to highlighting the work of Dr. Dia and the H.Y.P.E. 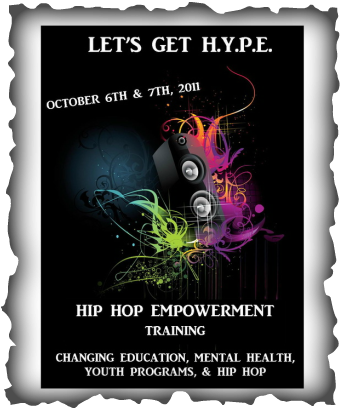 curriculum, our e-newsletter has spotlighted others using Hip Hop to empower through The H.Y.P.E. Monthly Spotlight feature. If you haven't already, please subscribe to The H.Y.P.E. Communicator by emailing us at getwithype@gmail.com, and label the subject "Get H.Y.P.E. News." Look for bigger and better from The H.Y.P.E. Communicator as we enter year two! In this intimate interview, Dr. Dia talks about her personal journey and how it impacted the development of H.Y.P.E. She shares how determination and innovation have aided her throughout her journey, and how these factors will continue to guide her success. Please read and share this article on Facebook and Twitter. Dr. Jamaal Scott holds a doctorate degree in Clinical Psychology, and is the developer of Reel Talk, a Cinema Therapy curriculum. 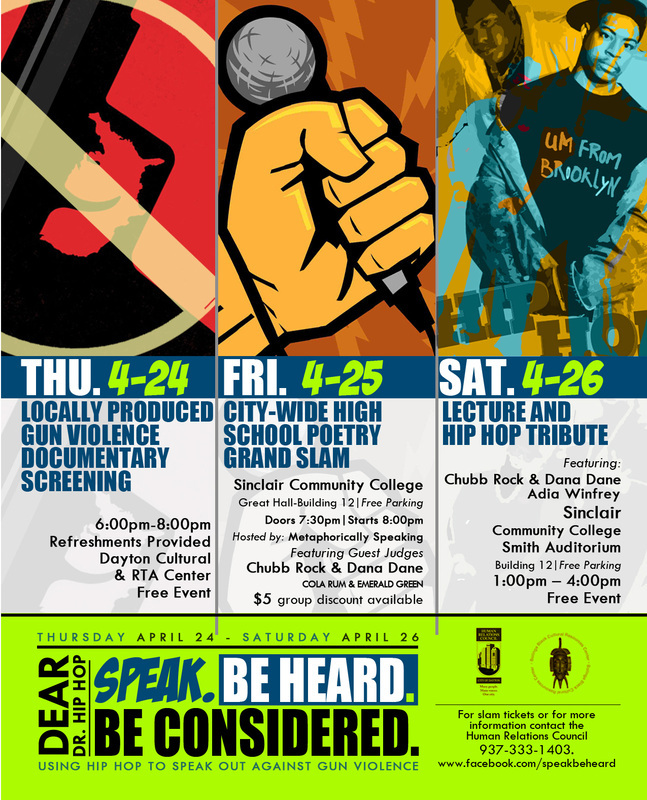 Reel Talk is comprised of movies reflective of Hip Hop culture including Juice, Boyz N The Hood, and ATL, to name a few. Dr. Scott edits the movies so the main character’s story is isolated. Based on the events depicted in the clips, group members describe how they handled similar situations or the actions they’d take if they were the main character. The goals of Reel Talk are to improve decision-making skills and enhance cultural awareness. Dr. Scott has implemented Reel Talk with youth throughout the country in a number of settings. He's also presented his program model to psychologists and other helping professionals at a variety of conferences. Currently, he's seeking fellowships that would allow him to evaluate the efficacy of Reel Talk, leading to evidence-based recognition. Dr. Scott has a Google group forum titled Urban Interventions, which connects those using unique methods to reach youth of color nationwide. Contact Dr. Scott at jamaalpscottpsyd@gmail.com to learn more about Reel Talk or to join Urban Interventions. Dr. Dia on The Unchained Mind Radio! 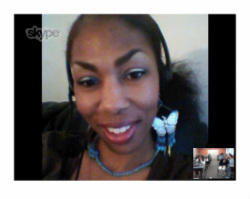 On October 3rd, 2010, Dr. Dia was interviewed by The Unchained Mind Radio's own Najah and Christina. During this interview, Dr. Dia talked about the foundations of H.Y.P.E., the Girlz Get H.Y.P.E. curriculum, issues impacting youth throughout this country, and the power of Hip Hop. The interview was very emotionally charged, and several callers were able to ask questions and make comments. Though the interview was scheduled to last one hour, it lasted nearly two hours, as listeners continued to call in. Listen to this powerful interview, by clicking here. The Unchained Mind is a virtual non-fiction book club that explores books chronically the Black experience. Click here to check out their website! On October 1st, 2010, Dr. Dia conducted the H.Y.P.E. Webinar Session, which was attended by individuals from across the country. The H.Y.P.E. theory was outlined, and a brief overview of each session was provided. Participants were also given several options for being involved with the H.Y.P.E. Movement, and provided an individual consultation afterwards. Interested in attending the next webinar? Email us at getwithype@gmail.com. Toni Blackman is an international Hip Hop champion. She's the first Hip Hop artist to work through the U.S. Department of State as America's Hip Hop Ambassador. Founder and director of Freestyle Union, a cipher workshop that uses free styling as a tool to encourage social responsibility, Blackman's work has held great influence in the world of Hip Hop activism. Toni has worked extensively with the Girl Scouts of America and was instrumental in launching "The Girls Hip Hop Project" at the Center for Cultural Exchange, providing workshops for teenage girls from the Sudan, Somalia, and Eritrea. During the World Cup held in Johannesburg, South Africa, Toni and Man Up held the "Young World Leaders Summit," a global initiative targeting violence against women. her own brand of AfroGlobalHipHopSoul, an amazing rhythm section, DJ, and guest artists from Senegal, Cote d'Ivoire, Burkina Faso! Toni Blackman is all heart, all rhythm, all song, all power, a one-woman revolution of poetry and microphone. Learn more about Toni at toniblackman.wordpress.com. The Hip-Hop Summit Youth Council (H.H.S.Y.C.) is a New York City-based organization founded in 2001 that has rallied and held events addressing issues including youth violence, juvenile justice, education, and poverty. The H.H.S.Y.C. has partnered with numerous organizations over the years including the United Nations for their annual International Day of Peace. And just weeks before the catastrophic earthquake in Haiti, organized a concert with the STARFESTMulti-Cultural Music Festival Series bringing artist Rick Ross to an estimated 500,000 fans. On September 19, 2010 the H.H.S.Y.C., the Millennium Development Goals Awards Committee, current and former NFL players, the Jack Brewer Foundation, and others will launch the Millennium Development Goals Awards at the Waldorf-Astoria Hotel. Learn more about the H.H.S.Y.C. at hhsyc.org. Philadelphia Children In Pursuit (P.C.I.P.) 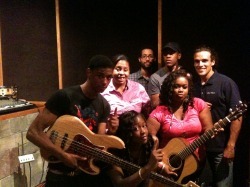 is a non-profit recording arts, writing, and music intensive program for high school students. The mission of the organization is expanding horizons for youth interested in pursuing music based careers, with a focus on education and the arts. P.C.I.P. is “studio-based,” and engages participants through producing and recording original music, as well as analyzing song lyrics and later altering them to fit their life circumstances. Contact Mr. Paul Dunnaville, P.C.I.P. Executive Director, at pdunnaville@gmail.com to learn more. Listen to music recorded by other Philadelphia youth Mr. Dunnaville has worked with by selecting the following links: ysamusic.bandcamp.com& saintpaul.blip.tv. Tupac Amaru Shakur was June's H.Y.P.E. Monthly Spotlight. His efforts to improve life for the "forgotten" youth throughout the nation in his 25 short years should inspire each of us to advocate for our children. 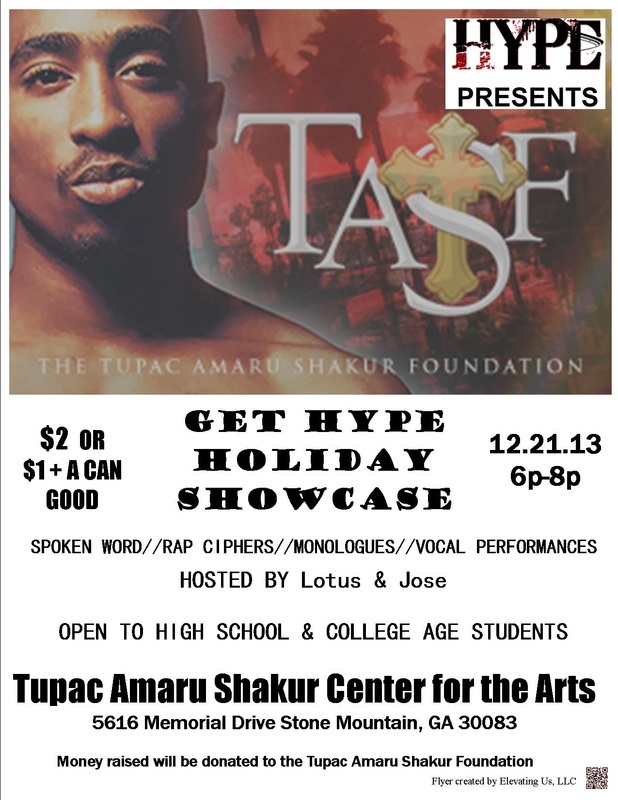 Learn more about Tupac Amaru Shakur and his legacy at www.tasf.org. Dr. Dia on the Michael Baisden Show!! On Wednesday, June 23rd, 2010, Dr. Dia was featured on the Michael Baisden Show, sharing her thoughts about the importance of reading and the necessity of H.Y.P.E. The Michael Baisden Show is a nationally syndicated radio show that airs weekdays from 3-7p EST. Please leave your feedback from the show on the letsgethype.com Guestbook page. Dr. Dia participated in the One Voice One Sound Griffin Awareness Day rally, in Griffin, GA. Griffin Awareness Day was organized after Yung Hott, an up and coming Hip Hop artist was killed while filming his video in the small town. One Voice One Sound, an organization committed to eliminating gun violence, travels throughout the southeast organizing block parties that sharing information to empower youth and their families. Look for future collaborations between Dr. Dia and One Voice One Sound. On April 24, 2010, Dr. Winfrey conducted two workshops at the Adoptive and Foster Parent Association of Georgia's (AFPAG) Regional Conference, held at the Georgia International Convention Center. AFPAG is an organization that advocates for children in foster care, as well as for the rights of adoptive and foster parents. Dr. Winfrey's workshops were attended by nearly 200 AFPAG members and county workers. Topics included parenting children exhibiting explosive behavior and fostering teenagers. PEMG is an ongoing project founded by artist/activist NYOIL to build an independent style label while mentoring young artists. PEMG consists of 10 youth ages 12-20, whose membership requires they abstain from drugs and alcohol, consistently improve at school, and be committed to not including “profane language” in their music. Click here to view PEMG "Countdown": http://youtu.be/HjzGxdTtpNQ?a. Hip Hop Education Center Features H.Y.P.E.!! Hip Hop Education Center is the premier research center for the study, training, and assessment of Hip Hop Education. The mission of H2ED is to amplify social equity in poor communities by encouraging the use of Hip Hop based arts education and culture in the curriculum and the community. 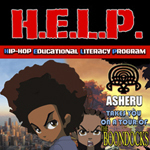 Check out the Hip Hop Education Center at http://www.squidoo.com/HipHopEducation. On March 17, 2010 gospel360online.com writer Ms. Sherita Searcy, interviewed Dr. Dia exploring her journey and hopes for the future. Check out the entire interview at http://www.gospel360online.com/archives/2740. On December 19, 2009, Dr. Dia was interviewed on NYC radio station WBCR. Listen to the entire interview provided on the homepage of this website! Using Hip Hop as a vehicle to educate, heal, and empower.